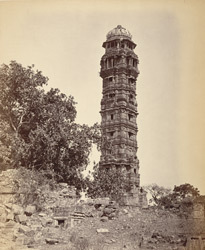 Photograph of Jaya Stambh or Tower of Victory at Chitorgarh from James Burgess' 'Photographs of Architecture and Scenery in Gujarat and Rajputana' taken by Colin Murray in c.1872. The Victory tower is situated in the impressive hill-top fortress of Chittorgarh, which was ruled by the Guhilot (later Sisodia) Rajputs from the eighth century until the 16th century. In 1567, when the fort was sacked by the Mughal Emperor Akbar, Udaipur was chosen as the new capital of the Mewar state and Chittaurgarh was abandoned. The tower was erected in 1448 by Rana Kumbha (r.1433-68) to commemorate his victory over Mahmud Shah I Khalji, the Sultan of Malwa, in 1440. It measures approximately 37.2 m (122 ft) and consists of nine storeys with openings and balconies and pierced stone screens at the lowest level. The external walls are covered with images of Vishnu, to whom the tower is dedicated and of other Hindu deities. The dome at the summit is a modern addition and is reached by an interior staircase.